Just a quick video update (I say quick, it took over 90 minutes to upload it...) of what I've been doing lately. With a sneak preview of Ishoo Wun-Oh-Ate of all things. But then I got bored. At the Hoodling's Hole no less. And what else was at The Hoodling's Hole? 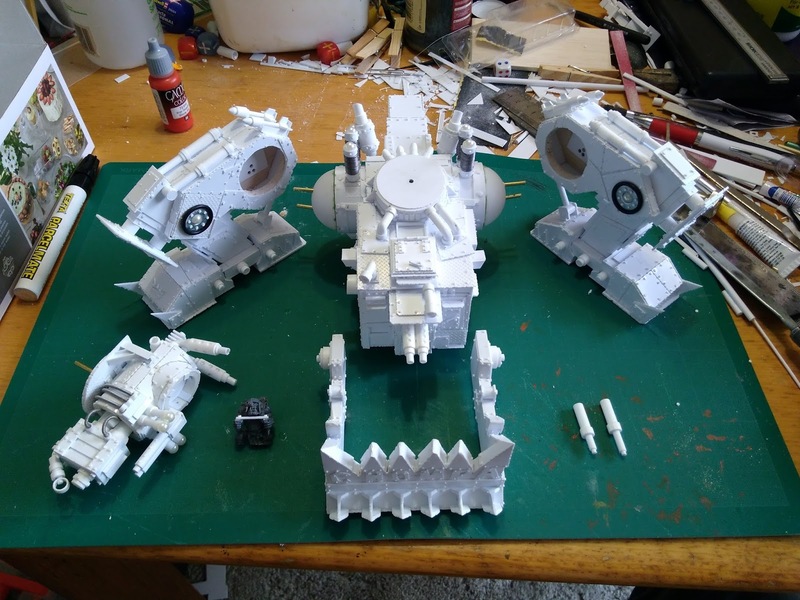 Why, Tim's infamous Sacral Vault Conversion! Which Tim leaves at The Hoodling's Hole out of a general lack of the hobby-balls required to complete it. You see, Tim was struck by a vision about two years ago. A Hordes Minions Sacral Vault for his Minions army being swooped on by a Storm Raptor from his Circle Orboros army. He bought the models. They sat at Greg's for six months. He stuck a few things together. Then lost interest for six months. Then he stuck a few more things together, looked at the massive mounting point on the Storm Raptor's tail, lost heart and they sat at Greg's gathering dust for another six months. So I decided to show him how real men hobby. 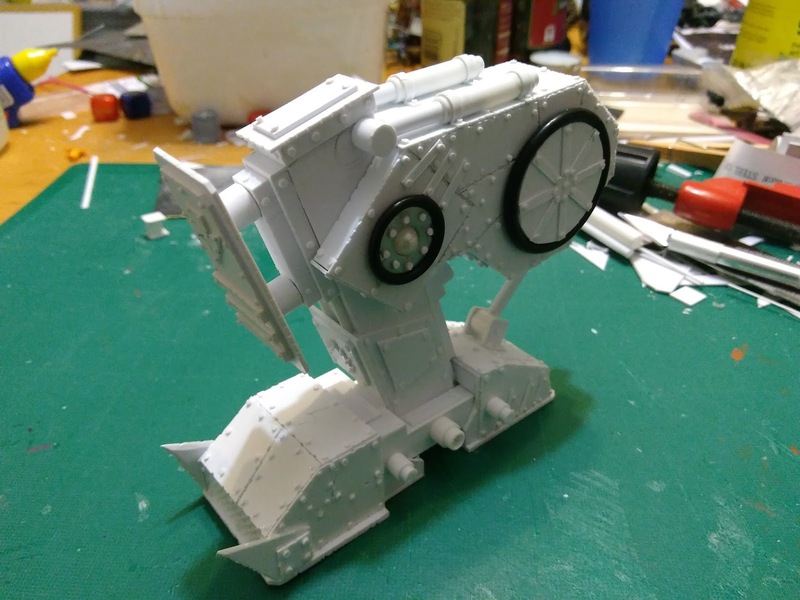 By building the Mk.1 Tim Taunter. This is about four hours worth of Tim Taunter next to over two years of stalled sacral vault. This much hobby could not assuage me. And painting the Morkanaut is kinda tedious. So Saturday arvo I started a small project. 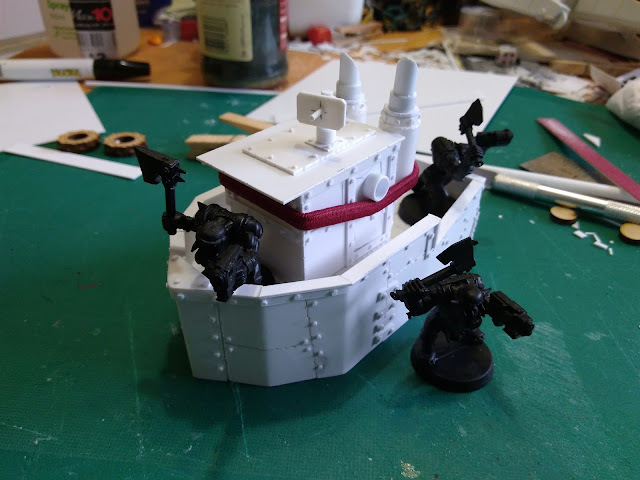 I have decided that my Orks come from SkegOrkness, a terrible English 1950s seaside resort and holiday camp they invaded and took over. 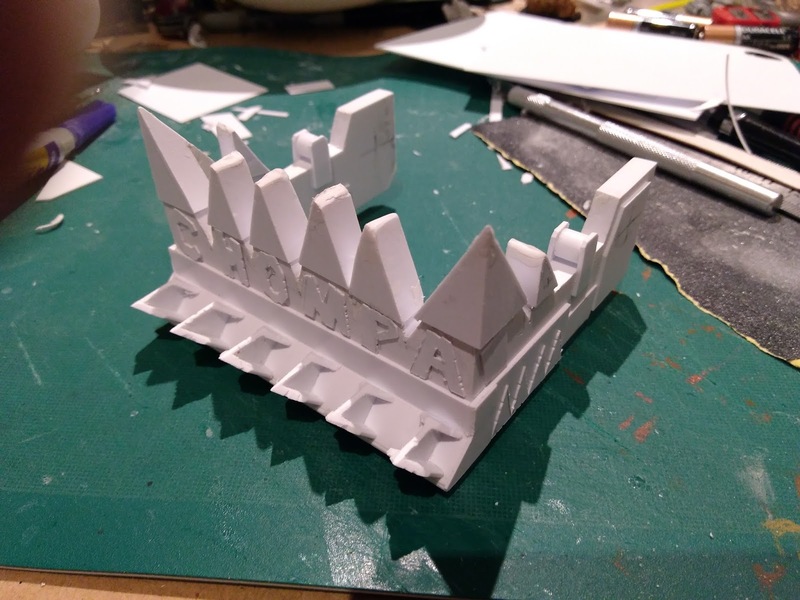 I plan to built a whole lot of themed terrain for it. Starting with the Good Ship Orka. Which is a small boat designed to sit beside the planned harbour or pier. The fetching rambo-esque headband is there to hold the exhaust stacks while they dry. The boat is NOT played by Sylvester Stallone. Focus! Gah! 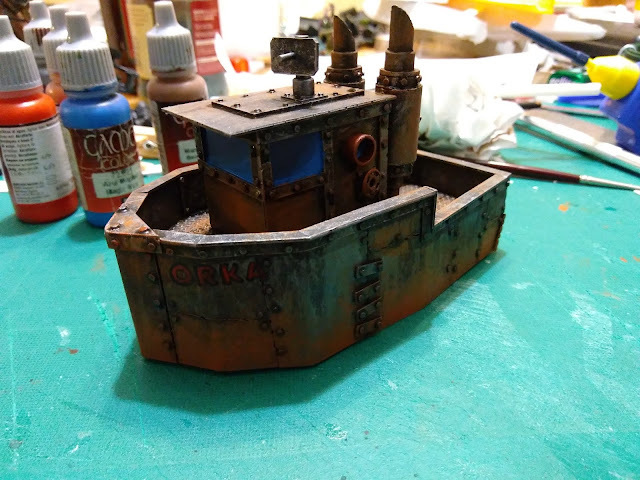 I plan to build atleast one more hull and cast it in resin so I can make a whole fleet of Orky boats. 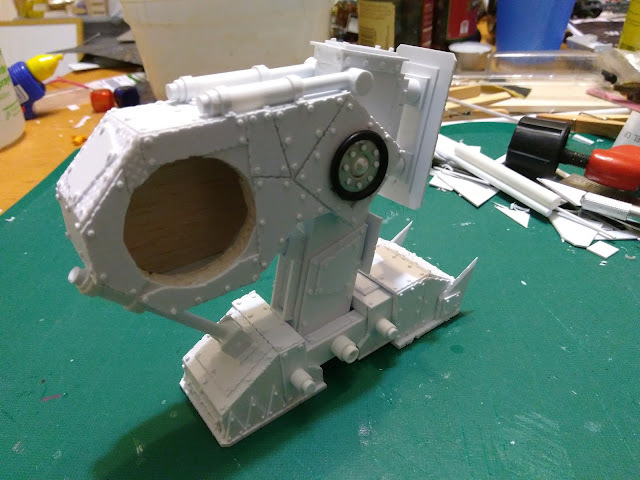 I'd glued the super structure on this one before I thought of it. 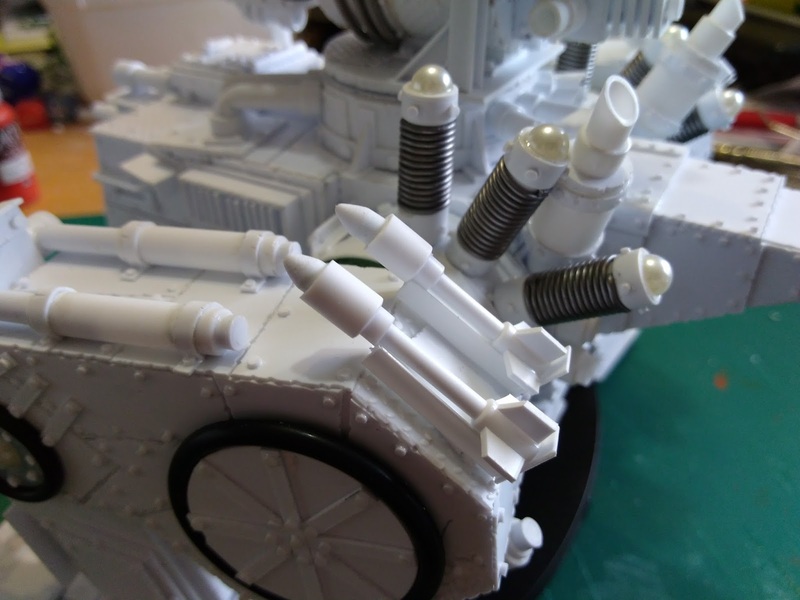 Oh well, more chances to glue bits of plastic together in strange ways! I've finally taken the plunge and uploaded some videos of my projects to Youtube. I tried this once before, and had a lot of trouble getting the camera on the right angle to demonstrate what I was doing, so I gave up on the idea and went to still images and blog posts. This time round I'm not posting tutorials, just video explanations and closer looks at finished projects. All orky ones so far. You can go check out my channel - it's not really set up yet. There are videos there, but I have done nothing aesthetic to any of it yet. 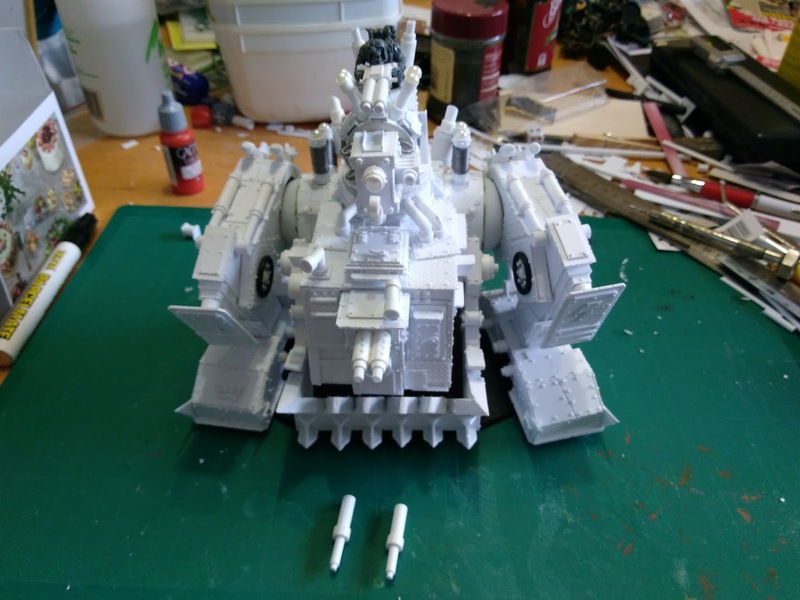 Pudding Wrestler's Perfidious Projects: Behold the Morkanaut! Guess I should either start the Gorkanaut or get some work in on the plane from Target. Anyway, that's my problem. You all want pics. The jaw is just resting against the body here - it will be much more raised and held with the hydraulics seen in front. I'm keeping things in pieces for painting, and the jaw sags as a result. The legs have been pinned on with two 2.5mm brass pins each. 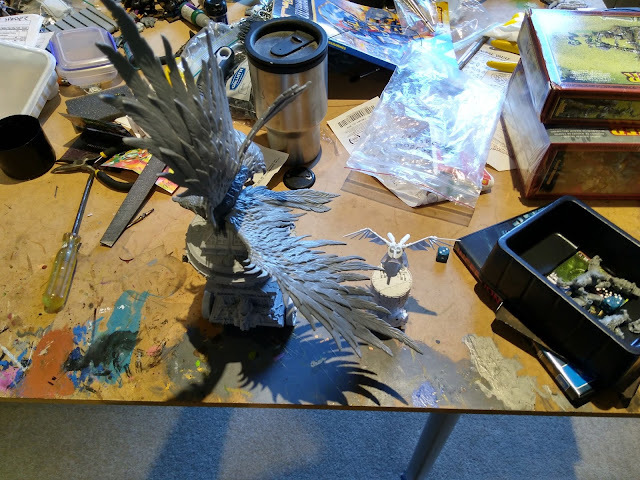 It has come out a bit bigger than the base. My original calculation involved thinner legs and hip joints closer to the body. I had forgotten to account for the jaw, which meant the legs needed to go further out. 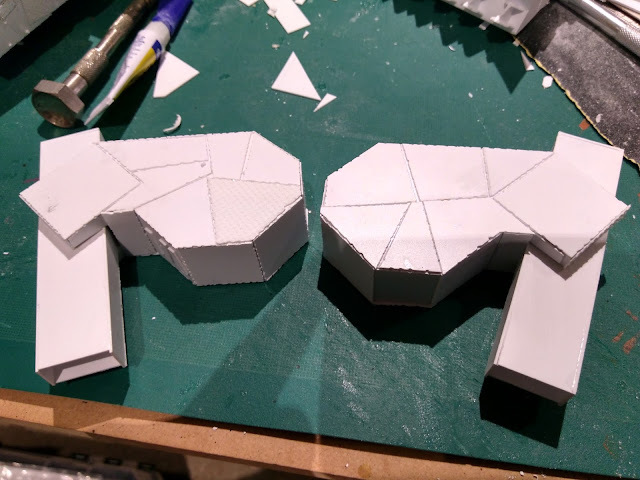 I also decided not to have armoured 'shoulder pad' things over the hip joints. This meant the Kustom Forcefield Projecta ended up built into the hip joint, and the twin rokkit launchas are now bolted right to the legs at the back. I made the rokkits from rod and tube with the warheads shaped by chucking them into a power drill and spinning against sand paper and emery boards. Here's the main gun. 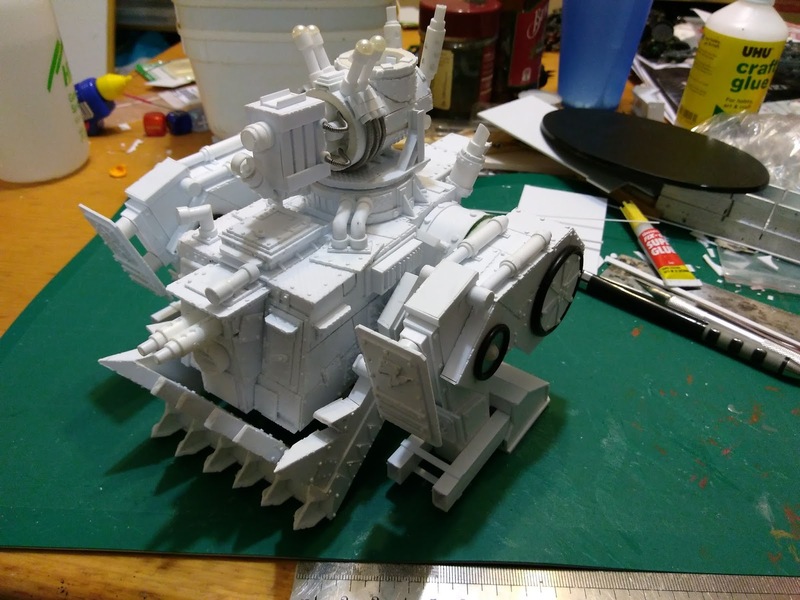 The Kustom Mega Blasta ended up as a co-axial mount. 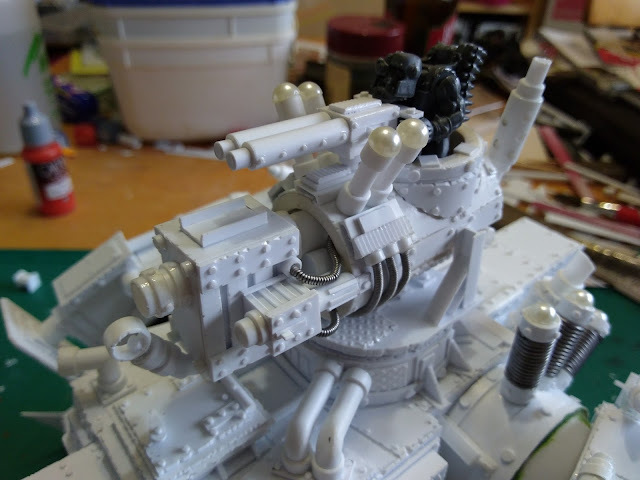 I also built an Ork to crew the pintel gun. 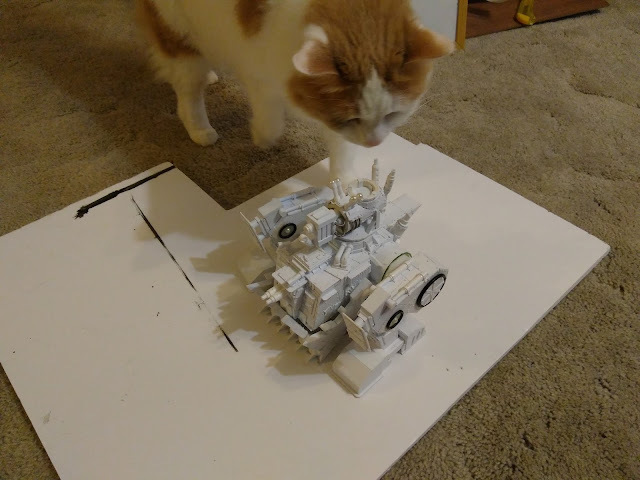 He is the only kit part in the entire build. Back again. Since the weekend, I've basically just been working on the feet. I've now got one foot complete and installed on the leg. 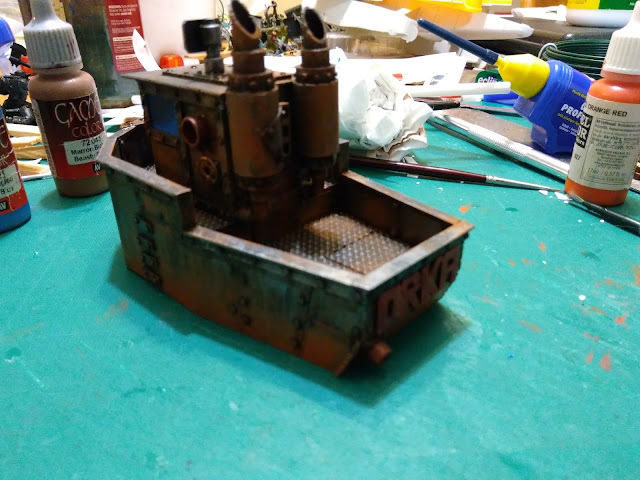 The other foot needs rivets. Then it needs to be installed on the leg. And the leg needs more rivets. All of which means there's a fair chance of getting this machine done by Sunday. Not going to guarantee it, but it sounds possible. The Fluff Squig seems to approve, but wonders why there are only two legs. Surely Orks, being superior beings much like the fluff squig recognise the advantages of the quadruped layout? This is the completed leg. The knee armour has not been glued on so it can be removed for easier painting. The legs are reinforced and bulked out with balsa. 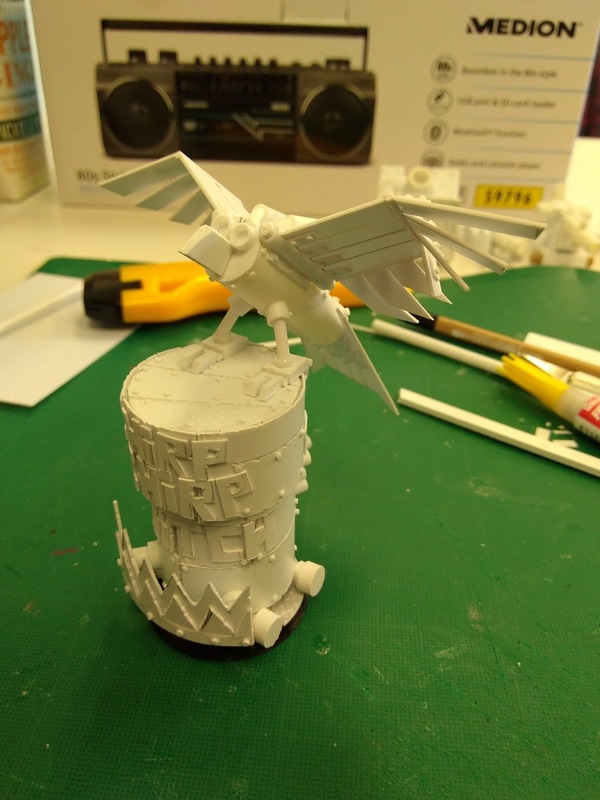 I need to add more plastic on the inside to mount some brass rod pins which will hold the legs to the body. The plan is to have them removable for painting. Pudding Wrestler's Perfidious Projects: Things become clearer. 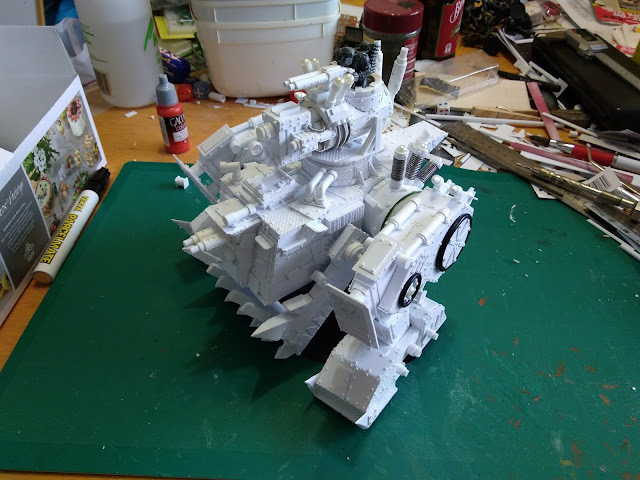 Normally, I wouldn't post an update with only one picture, but there's been a lot of progress, to the point that the Mysterious Orky Thing of Mystery's true form is now evident. 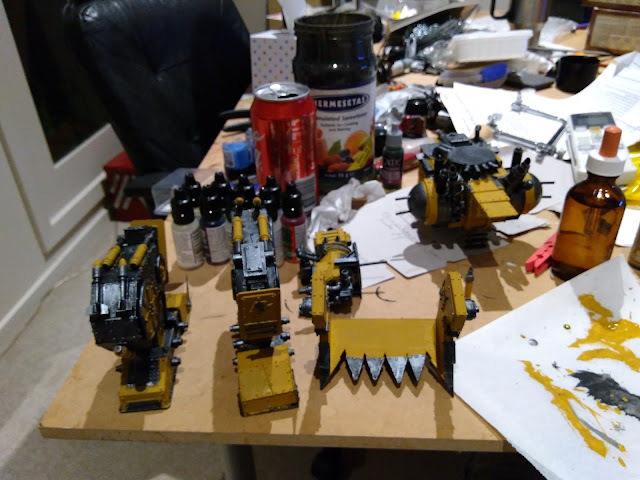 A combination of spending painting night at the Hoodling's Hole on Friday, club time at HGC on Saturday (until I had to leave early for a party - damn this social life!) and messing about at home this afternoon and evening have all lead to some clear progress. The upper and lower legs are now basically complete apart from riveting, detailing and some hydraulic systems. The feet are only just started but have reached the point where they can support the legs and allow a proper mock-up photo to be taken. The jaw is basically done and awaits some hydraulics being fitted to the body to allow it to gnash properly. 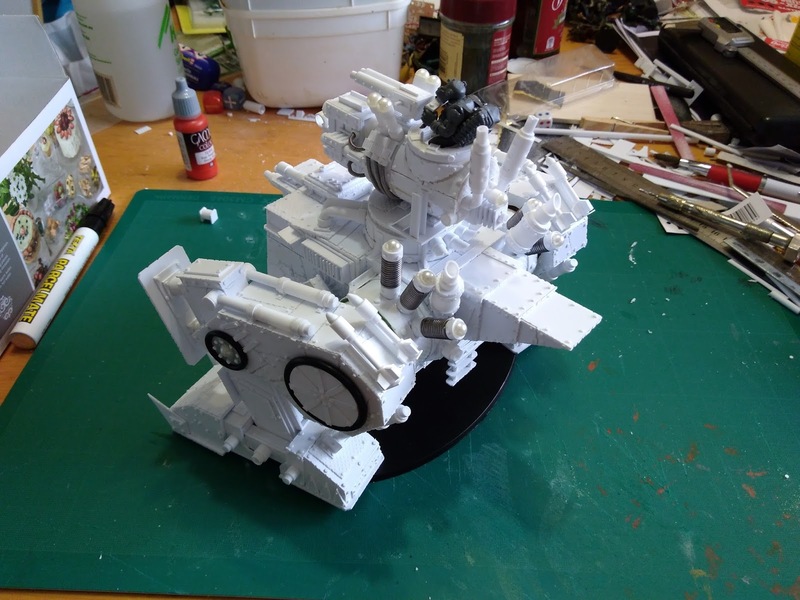 Of course, I will be leaving the jaw off for painting. Now it's a matter of finishing the feet, then adding some 'shoulder pad' style armour over the legs to hold some of the weapons and force field generators, and finishing up the legs. The end is in sight. Pudding Wrestler's Perfidious Projects: 2Mystery 4Mysterious. Cancon is over. The holidays are over. Productivity is slowed but NOT over! 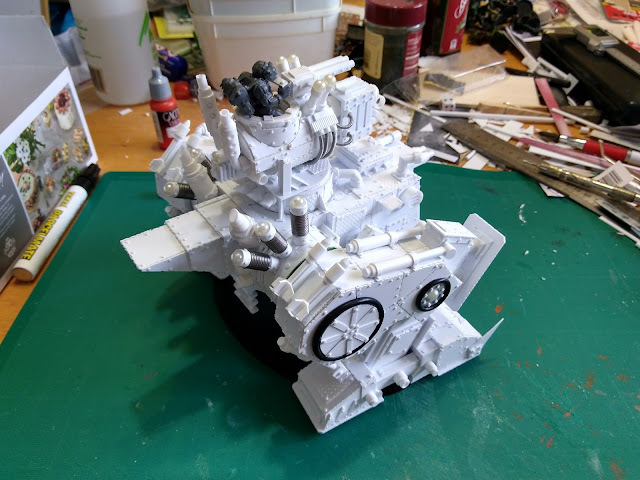 In the week since returning from Cancon, the Mysterious Ork Thing of Mystery has not seen as much activity, but it's form has become slowly more evident. Last night was Ye Olde Traditional Descent of Ye Hobbyists on Greg's Place, now so often diluted by the lure of MechWarrior Online. This meant that I was able to get some heavy duty work in on the Thing. Work which will probably finally give away what it is. Well, almost. 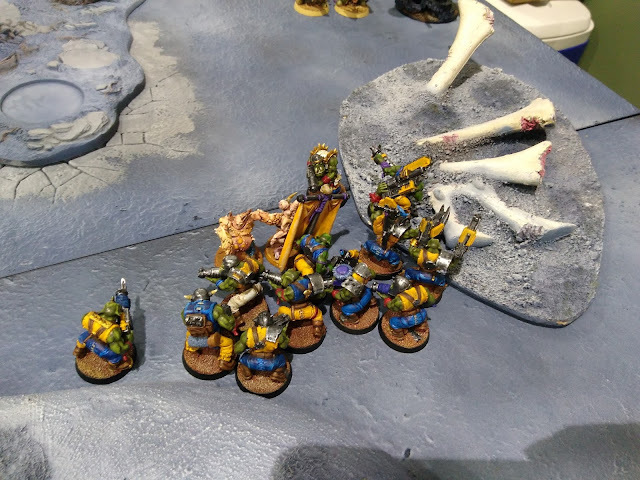 Here we see the might of Waaagh Snaggatoof in the process of being victimised by the dread legions of noted man-with-beard, Sean. 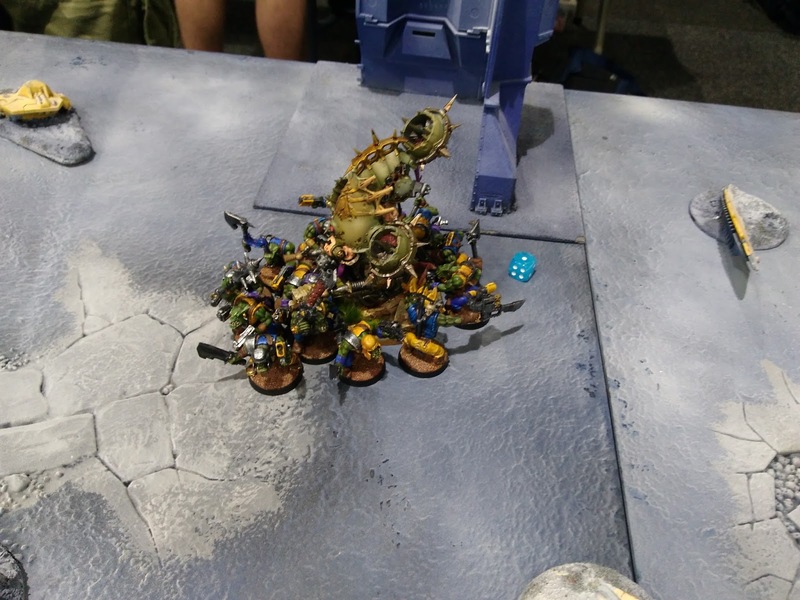 Here said Waaagh attempts to victimise one of the lesser portions of said legions. While other potions of said Waaagh are unclear on who is being victimised on the other side of the board. This is Table Three. 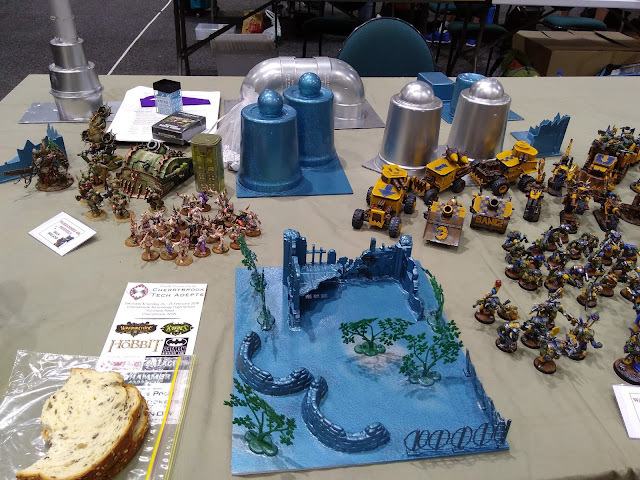 This is where I had to display my army for judging. My lunch is also on display. It was a constant struggle not to shed a single manly tear over how poor the terrain on this table was. 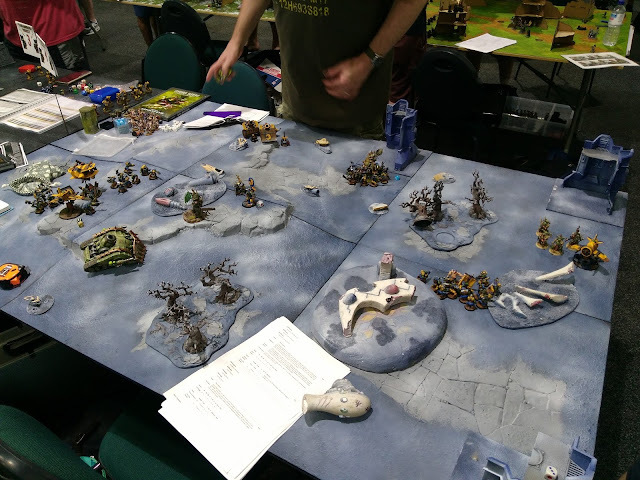 Then I went to visit my Warmachining associates, who pointed me at the 9th Age tables. The sight of plain MDF boards with no cloths and printed and laminated sheets with bird's-eye photos of terrain on them caused me physical pain. I am near to tears merely remembering it. 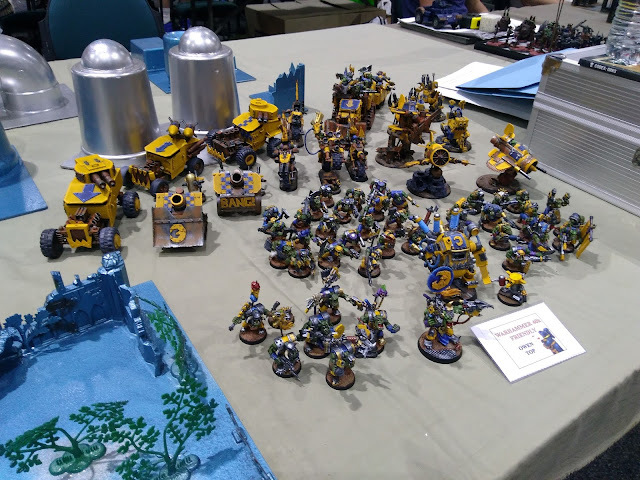 Here the collected might of Waaagh Snaggatoof is seen failing to win any painting and modelling prizes. But what is this? 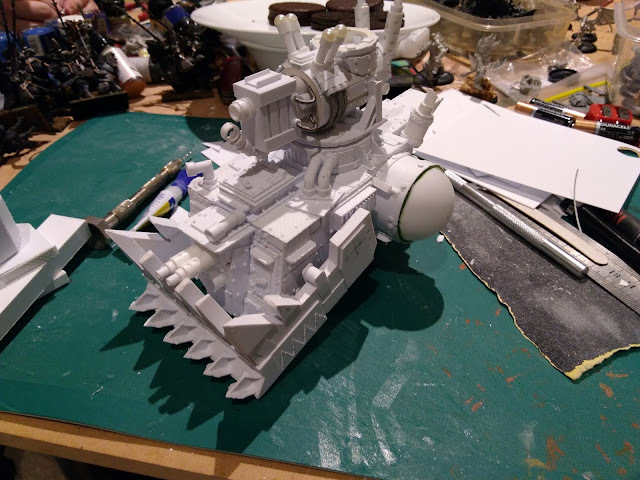 Progress of the Mysterious Orky Thing of Mystery? And completely new parts? Sorcery! Sorcery I say!